Billionaire Non-delivering ‘Spiritual gurus’ The ‘many-billion dollar question’ is not really so much how Sai Baba has generated such huge coffers, for this is almost ‘par for the course’ for Swamis, gurus and temples in India. Tirupathi is reckoned to be the most fabulous as to wealth, and the Puri Temple of Jagannath is not far behind. 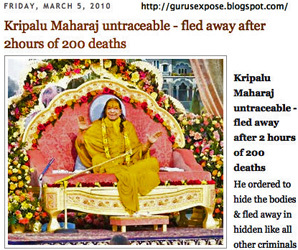 Sathya Sai Baba may still not have become top of the ‘national treasure’ pile yet. The self-entitled ‘Baghwan’ Sri Rajneesh (aka Osho) had vast sums before he was indicted by the US Government on so many criminal charges that he had to sell of cheaply his 84 tax-evasion Rolls Royces to a second-hand car dealer in Texas and flee justice, yet he still could lord it over most Indians financially when he settled in Pune. The sect of the Maharishi Mahesh Yogi is likewise in the money beyond any accounting, his people even having taken over an African state’s economy more or less! [One may pause to wonder whether all this – with the massed chanting of mantras etc. 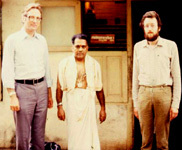 – has stopped drug taking, urban violence, terrorism and brought about peaceful communities and a better world, as the Maharishi has many times guaranteed it would? I’d say no more than Sathya Sai Baba’s promises that India would be transformed by now (due to his 1960s students’ taking over important positions) and become the moral and spiritual engine of the world in a Golden Age (which is long overdue after repeated but unacknowledged ‘postponements’ . No, the question without a price tag is still why Sathya Sai Baba, who vociferously disdains ownership and filthy lucre, should be one of the richest persons and biggest property owners in that land of such poverties and sufferings? That he claims to own nothing is just a front for the gullible and his trusting followers, for it is a mere technicality. It is the Sathya Sai Central Trust and he rules over it totally, even signing every cheque, so he has stated himself in 1993. The tax-free charitable Central Trust remains essentially behind closed doors, no minutes revealed and no accountability for the expenditure. Is it’s wealth being properly used? Or squandered on too great a scale to build yet more temples and white elephant ‘spiritual museums’, all clearly designed and decorated so as to trumpet the name and fame of Sai Baba himself. Questions as to the misuse of funds expended in building an isolated Super-Speciality Hospital is cogently discussed in Serguei Badaev’s overview of the Sai Baba Super Speciality Hospitals’ wastefulness. If this had not been so, the answer would have been clear and acceptable. The putative fact remains, Sai Baba’s monies are also used for gaining influence and political power, and without any visible beneficial effects on politics or politicians. The current state of political dishonesty, disinterest for the poor of India, and scams at all levels in India suggest nothing is changing, the rich get richer, the poor get poorer (certainly relative to each other and to the basic cost of living). 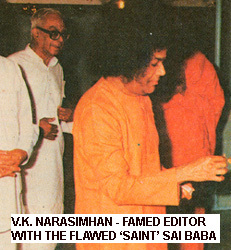 Sathya Sai’s much heralded “Divine Plan” for changing India – promised to be soon even in the 1960s to Dr. J. Hislop in the well-known interviews he published is not a fact, but a vehicle of falsehoods and foolishly placed faith. See also ‘How far is it to dharma?‘ Ask devotees about it all and they will tell you “Baba has divinely good plans that no one but He can fathom. We are all but puny minds, how can we possibly know?” That is a great conversation stopper to end on!